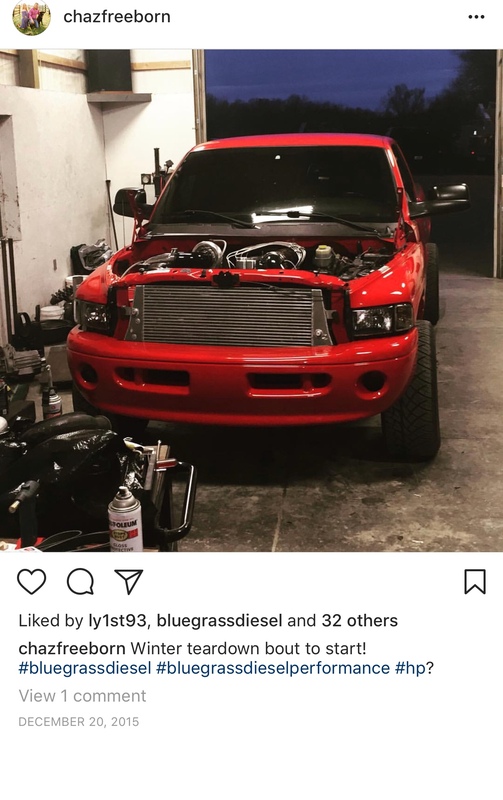 Was cruising through the gram where I found a pretty sick 12 valve owned by Chaz Giles, figured I’d post this since compd just seems to be a commonFail infestation as of late. I am impressed with the air combo, 472 over a 488 according to an Instagram post. Curious who’s injectors and injector pump are on it. Hart’s injectors and I cant remember who’s pump. Bluegrass diesel built the truck. Saw it at sdx one year. This is the 2nd or 3rd strong running truck running the 488 as a primary I've heard of. Makes me wonder if the money I paid for a custom built 485 was worth it, or should I have just went with the box 488sxe. Wow! That is just nasty. Not everyday you see a 12 valve destroy a dyno like that. New fav truck on the gram. Wicked clean. Its actually a pretty simple build. The truck is immaculate. 2002 with less than 100K miles. Last edited by BluegrassDiesel; 10-29-2018 at 06:26 PM. What's the main reason you went with the 24v pistons and 12v head? Obviously it works! Somehow dyno numbers have become like computer memory numbers for me. I'm so used to seeing these numbers that would've been ridiculous 10 years ago, but my brain cannot fully comprehend them so it just goes "oh, another crazy-big number, I guess that's where they're at nowadays". 1600 HP in a street truck? That's flying at a dizzying height. Last edited by Begle1; 04-12-2019 at 02:53 PM. 1600 on the bottle. 1300 on tap is pretty crazy for a street 12v. This is somewhat of an inspiration really for the guys that have that goal of 1000hp. Driver side ball joint looks to be leaning about as hard as mine is right now. Killer setup! Can't imagine what it's like to drop that hammer.